Leopard-spotted white horses have been around since ancient times. Paleolithic cave paintings in Europe dating back 25,000 years depict wild horses with dark spots on a white base coat. Thousands of years later, these leopard horses became very popular with the European upper class. Even the Spanish Riding School’s famous Lipizzaner horses once came in this colour. In Denmark, the Knabstrupper breed was created based entirely on Spanish-type horses with leopard colouring. Leopard-marked horses were prized everywhere from Scotland to Mongolia and China and everywhere in between, and were considered suitable war horses and mounts for kings, queens and members of the aristocracy. There are many European and Asian paintings, frescoes and tapestries from as early as AD 1100 showing leopard horses. What is a Leopard Horse? Appaloosa spotting, named for an American breed of horse, is a combination of dark and light hair arranged in several very specific patterns that are completely different from pinto spotting patterns. Appaloosa spotting is caused by the gene called the leopard complex, or LP, which was isolated in 2003 by an international research group called The Appaloosa Project. The latest research indicates that the LP gene is actually varnish roan, but the original name was retained. The true Appaloosa coat pattern is always accompanied by some or all of these characteristics: white sclera around the eye, extensively striped hoofs, and mottled skin. Varnish roan, the basis of the Appaloosa colour, is a mix of light and dark hairs. A horse with the LP gene but no modifying pattern gene will be a varnish roan Appaloosa, with “varnish” marks on the bridge of the nose, knees and hocks and dark and light hairs mixed throughout the body. True leopards carry one copy of the LP gene but also have have a modifier gene called Pattern 1 that organizes the white and dark hairs, creating a white background covered with coloured spots, like the pattern of an adult Dalmatian dog. True leopards are born leopard, and the number and location of the spots does not change. The only thing that can change a leopard's spots is the gene for grey, which fades the spots and is thus undesirable. Few-spot leopards are born nearly all white with varnish markings but almost no spots, due to having two copies of the LP gene instead of just one. Few-spot leopards will always produce an Appaloosa-marked foal, even when bred to a solid-coloured horse. Non-leopard Appaloosas have a different modifier called Pattern 2 which sorts the coloured and white hairs to create a dark or partly dark body coat with white frosting or blanket beginning over the hips. The amount of white can vary widely and can be spotted or non-spotted (snowcap). Near-leopard is generally a full extension of blanket in which the horse is mostly white but with a dark or mostly dark head, neck and possibly legs. Pattern 2 horses can become more colourful every time the old coat is shed out. Some get more roaned over time or gain white “snowflake” spots. A foal born dark with a blanket and spots can end up all white but with the spots intact, so that it appears leopard, but these horses will have the spots concentrated over the hips, while a true leopard is spotted nose to tail to hoofs from the moment it is born. 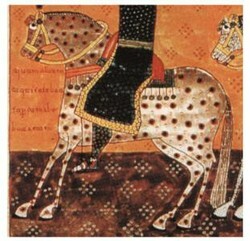 Leopard horses appear in art and legend across Europe and Asia. They are pictured in cave paintings in France, and recent genetic testing has confirmed that the LP gene was present in those ancient horse populations. One of the earliest literary references is the Persian story of Rustam and his spotted stallion, Rakhsh (or Rakush), from 500 BC. Spotted horses appear in China before 200 BC and the colour can still be found in Mongolian horses. Bonnie Lou Hendricks, author of The Encyclopedia of the Horse, states that the Chinese used spotted horses to transport silk on the Silk Road through Russia and into France, Spain, Austria, Poland and even North Africa. There is no history of LP spotting in African Barbs or in Arabians. Probably the pattern found in the Spanish horses was inherited from native European horses (descendants of the ancient horses shown in cave paintings) and horses brought from Persia, India and the far East. The Thoroughbred, a descendant of Barbs, Arabians and Akhal-Tekes, does not have the LP gene. Genetic testing is currently being done by The Appaloosa Project researchers to determine the origins of the LP gene in North American Appaloosa horses. When the Spanish arrived in America in the early sixteenth century, they brought Andalusians and Lusitanos from Spain and Portugal, smooth-gaited Spanish Jennets, and Barbs from Tunisia, Libya, Morocco and Algeria. Some horses were a mix of these breeds. Brightly-coloured horses were very popular, and equestrian paintings of the time show many of these Spanish horses were Palominos, buckskins, pintos and horses with Appaloosa spotting. At that time, Europeans considered the Spanish horse to be the finest, most intelligent, most courageous and most beautiful in the world. According to equestrian scholar Thornton Chard, the first Spanish horses in mainland North America were the 50 brought to Puerto Rico and then to the mainland by Ponce de Leon in 1521. That expedition onto the mainland failed and no horses were left behind. Breeding herds brought to the Caribbean islands, Mexico, and Central and South America thrived, but a high percentage of the Spanish horses from many additional expeditions into mainland North America ended up slaughtered for meat or dying from hardship, lack of food or being killed by Natives. In later years, Spaniards lost horses to the wild on a regular basis. Some were stolen by Native people. By the mid-1500s, the Tuscaloosa and Chickasaw people were beginning to use horses, and the horse culture was spreading fast. In 1686, the French explorer LaSalle, who brought no horses with him, purchased five horses from local Natives and said that horses were plentiful amongst the tribes near the Mississippi River. By 1700, horses had spread to tribes in Canada and west to the Rocky Mountains, and there were large herds of horses running wild across the western plains. In Oregon and Idaho, the Nez Perce people practiced selective breeding for horses with stamina, strength, courage and trainability. They especially valued good horses with spotted coats. When explorer Meriweather Lewis saw the spotted horses of the Nez Perce in 1806, he was surprised by the numbers, the colours and the high quality. He also noted that, except for their colour, they looked more like eastern Thoroughbreds than like Spanish horses or Mustangs. Since the Nez Perce lived near the Palouse River, their colourful horses became known as Palouses or Appaloosas. 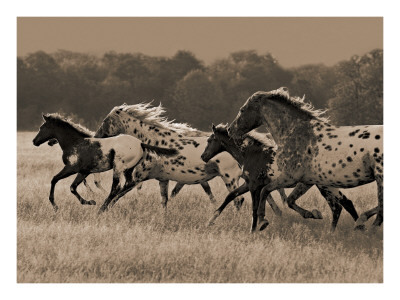 Other tribes such as the Comanche and Choctaw had Appaloosa-marked Spanish mustangs. The late Leonard “Black Moon” Riddles (1918-2003) said his great-grandfather once owned about 250 Appaloosa horses. That would have been in the early to mid-1800s. There were such vast herds of wild horses over such a huge area that it seems impossible for so many to have descended only from escaped or stolen Spanish horses. And why did the Nez Perce horses look so unlike horses of Spanish descent? There had to be another source, not just of horses, but of the spotting patterns and the overall physical type. If you enjoyed reading about the Appaloosa, here are some books for children and adults about Appaloosas and the old west. A celebration of of this eye-catching all-American breed of horses. Very interesting. I never knew where the Appaloosa came from. Wonderful!!! Really well researched and written! Enjoyed it!